As a fourth time mama now, I can’t tell you just how much I’ve come to deeply appreciate the staff that has taken care of me and each baby through every delivery. They are absolutely amazing people (even the couple “grumpy” ones I’ve had are still amazing people). The very first nurse who took care of me after my c-section with my firstborn is one of the kindest people I’ve ever met. She was beyond thoughtful and anticipated every need I’d have, making sure I was as comfortable as I could possibly be. During my last birth, which was honestly the most painful and exhausting birth I’ve gone through, I had the most fantastic nurse who was absolutely in my corner fighting for me. This has forever earned her a special place in my heart. But every nurse has been a hero to me in one way or another. They work awful hours and most continue to do their job selflessly with a smile and good attitude. I’ve had nurses who have shoved as many pads, Tucks, and diapers as they could get away with in my bag to help make life at home easier (and slightly cheaper ;)). And do I even need to mention the fluids they deal with? And they graciously clean it up and continue to treat you like a human of value afterward. Amazing. I praise God for every. one. of. them. Before my first was born, I was grateful that someone mentioned bringing thank you gifts for the nurses and staff. I took the time to make cute little gift bags with a little thank you note for each. I had the best of intentions to hand them out. But my first was a cesarean (thanks, little breech baby), so I was on pain killers that made me really tired and loopy. I think I remembered all of 3 times to tell a nurse to grab a thank you gift. Apparently I didn’t learn my lesson with my second. I still put together little gift bags, and once again, my brain failed to remember to hand them out. By my third baby, though, I figured it out. I grabbed a bunch of random snacks and mints, made a big sign, and put them in a durable plastic basket that I got from the Dollar Tree. 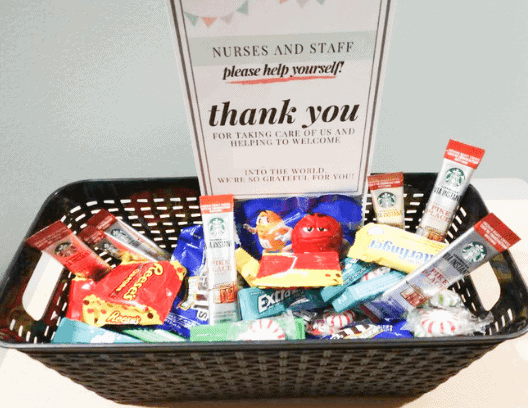 I remembered much more often to say, “please take a snack as a thank you!” Most nurses and staff seemed more comfortable with the lack of pomp and circumstance surrounding that, too. Also, when it was time for us to go, I just asked the last nurse we had to please leave the basket at the nurses station. Easy breezy, and hopefully a blessing. I used that knowledge to help pack for my fourth birth experience. Tip 1: I would recommend packing the mints in a separate plastic baggie. Trust me. Mint is potent and will mix with your Butterfingers. Just, no. Tip 2: Pack your bag of minties and all of the other treats in a gallon plastic bag. Once you get to the hospital you can just have your support person dump both baggies into the basket and stick the sign up. Done. I pack the treats and basket in my labor bag so that I have it with me right when I get to the hospital. That’s why I’d encourage NOT including things in the basket that will go bad (ie oranges), or get smashed (ie chips/popcorn). If you’re looking to have a thank you basket of goodies out, I put together a free printable for you to use. You can print and cut it out on some cardstock, write in your baby’s (or babies’) name (s), and you’re good to go! As a side note, there is ZERO pressure to do this. You aren’t an ungrateful selfish person if you don’t get thank you gifts for your nursing staff. There’s a lot you’re dealing with whether it’s your first or twelfth. So if you’re not able to put a thank you gift together, it’s ok. Your verbal thank yous and gratefulness will still be much appreciated by and go a long way with your nurses and staff.